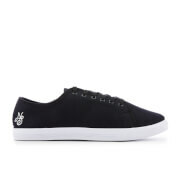 Men’s black canvas ‘Mervin’ trainers with herringbone patterned uppers from Jack & Jones. 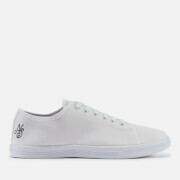 The lightweight trainers feature a lace fastening with metal eyelets, a selvedge strip on the heel and a rounded rubber toe cap. Set on a lightweight white EVA sole, the trainers are finished with a padded tongue and moulded sock for comfort, a textured outsole for added grip and signature branding on the heel and outer sides.